Frank Grzeszczak and Chany Sabates III, of International Yacht Collection, are central agents for two yachts at IYC’s Newport Open House to be held at Casey’s Marina, RI, between 17:00-19:00 on Wednesday 2nd September. The yachts involved are 175ft Chevy Toy and 147ft Tuscan Sun. "Chevy Toy is a new listing and is a boat Chany and I sold to the client a year-and-a-half ago,” explained Grzeszczak on Monday. “It’s going back on the market now and the owner is going to build another boat,” he continues. “We wanted to make the yacht available for brokers to see before the boat show. Tuscan Sun is also going to be there. 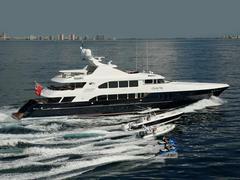 We are doing this for charter and for sale for both of the boats,” adds Grzeszczak. Built by Trinity Yachts and launched in 2004, Chevy Toy has an asking price of US$24.5 million while Tuscan Sun, launched in 2006, has an asking price of US$27.5 million.